We've compiled a list of 12 toolkit courses to get you started or boost your confidence in all areas of outdoor activity. Make this year the year! It’s a brand-new year. The tin of Quality Street has been put on the top shelf, you’ve unwrapped your shiny new toys, and resolutions for 2019 have been made. This will be the year you get out, make memories and challenge yourself. You’ve been thinking about it for years but now it really will be you in the photographs on the mountain or the water, and by next December you will be a different person. Yes! But it will take more than a new pair of boots and the best intentions to make the leap – to make your goal happen, you’ll need support – and that’s where Plas y Brenin comes in. Here’s a list of courses we provide throughout the year that will ensure 2019 is your most adventurous yet. If you book on with The National Outdoor Centre, you know that you’ll be learning world-class skills that will last a lifetime. All of our prices include accommodation, meals and equipment hire as standard, leaving you free to concentrate on learning and having fun. It’s time to make the commitment and make this year the year. Winter adds a different dimension to days out in the mountain, with colder temperatures and snow-covered terrain. It’s an amazing environment at this time but requires preparation and a different set of skills to operate safely. Our Welsh winter skills course gives you the chance to experience the snowy mountains with a seasoned guide and provides you the tools and confidence to extend your hiking beyond summer and into the winter months. You’ll be able to experience some of the most stunning views in a whole new light. In February it can be easy to lose focus and motivation. Stay on track with our Discover Navigation course and you’ll gain the confidence to explore the mountains and unlock your independence year-round. This course is suitable for complete beginners, young and old. Your instructor will make sure you get the most out of every second with us. Knowing what to do in an emergency takes the stress out of adventuring in remote places, and is a huge confidence booster. This course will give you the knowledge you need if something did happen, so you can focus even more on enjoying the view. You might’ve seen photos of a friend on Facebook climbing on a rock face in a stunning location and thought… ‘I’d love that to be me, but I have no idea where to start’. Our ‘Get Started Rock Climbing’ courses are the perfect way to get going in this incredibly rewarding sport, on a course designed to fit your comfort and ability level. Rock climbing has had a huge surge in popularity over the last few years, joining the ranks of Olympic sports for 2020. We think this is down in no small part to it being a great way to get fitter, have fun and improve your mental health. Accessible at so many levels, indoors and out, climbing is suitable for all shapes, sizes and levels of ambition. This course will demystify the sport and gently introduce you to its practices – so no need to worry about getting anything wrong. The rise of the GoPro has given mountain biking a reputation for being super gnarly – but this doesn’t need to be the case. Mountain biking can also mean gentle forest trails and family outings, seeing the countryside swoosh by from your wheels. Our Mountain Bike Fundamentals course will give you the knowledge and skills you need to make sure you get the most out of every ride, wherever you happen to be. Develop good technical riding habits right from the start to set yourself up properly, and ensure that shiny new bike won’t go gathering dust. North Wales from the water is another world entirely, and you don’t have to take on white water to see it. If you want to take up canoeing in 2019 but are feeling a bit overwhelmed by the world of kit or unsure of techniques and safety precautions, this course is the one that’ll get you started. We’ve got all the kit you’ll need to try out for free, so you don’t need to go out and spend a packet. By the end of the weekend you’ll have all of the foundation skills to paddle confidently into your new sport. Got the bike skills but in need of a new challenge? Join us in July and Shred Snowdonia for five days of riding world-class trails. This event is a great way to meet likeminded people who you could end up riding with for years to come. Double-win! It can be so easy to let a fitness goal slide as the year rolls on and life gets in the way. Sign yourself and a friend up to the Fifteen Peaks Challenge now and keep yourselves focused. Over the course of five days, you’ll take on Snowdonia’s fifteen-highest peaks, a challenging but stunning undertaking. By the time August rolls around you can celebrate how far you’ve come with an incredible adventure. Even if you don’t have all the kit, no need to worry, we will provide you with all you need to take part from our incredibly well-stocked stores. No excuses! Make the commitment and sign up now. This year is the year! Imagine living from your boat, sleeping under the stars, nights by camp fires in secret places. Try out a lifestyle you could have only dreamed of on our ‘Try Expedition Paddling’ course and paddle your way to complete freedom. You already know the basics of climbing and are getting stronger – now you want to take the next step and really focus on becoming a confident outdoor climber. Refresh your gear knowledge and technique on spectacular North Wales rock with the help of friendly, highly experienced instructors and consolidate your enthusiasm for this lifelong activity. Set yourself up to take your family and friends on micro adventures on our Mountain Skills course. 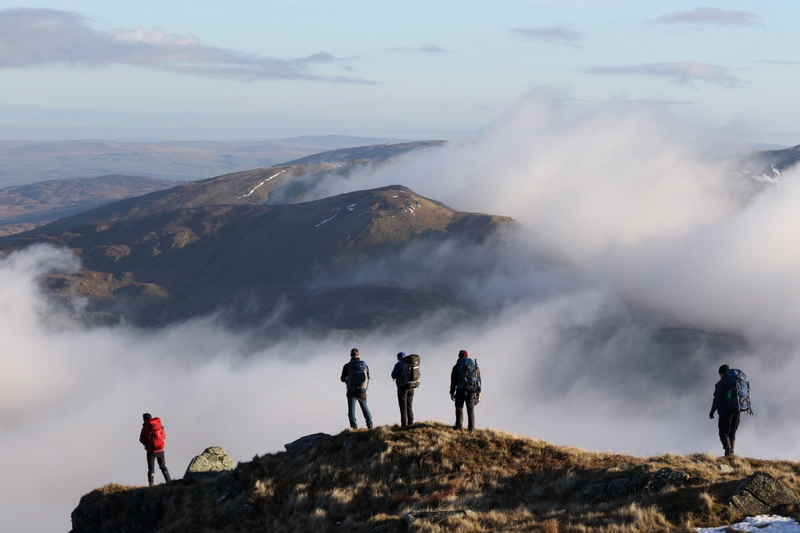 From planning to wild camping skills, night navigation to hazard awareness – these five days will give you the ability to take off on years of weekend missions or longer adventures. Learn from some of the UKs top mountain leaders and start building your own toolkit for adventure. December – Get in the festive mood in style! You’ve had an incredible year… you’ve stood atop many a mountain, climbed crags, explored by boat and by wheel… you’re feeling fantastic. Celebrate a year of amazing achievements, join us on our Big Christmas Walk and let your hair down. Give yourself that well-earned pat on the back on a relaxed weekend of walking, feasting and merry-making. Come along to our FREE weekly lecture series to boost your motivation and keep your head in the outdoors.